Microsoft amazes customers once again! As you probably recall, there was a huge productivity improvement in the user interface with the update from Microsoft Dynamics CRM 2011 to 2013. The update to CRM 2015 seems less important at first sight, but Microsoft amazes us once again with useful new features in the Spring 2015 release of Microsoft Dynamics CRM Online and Microsoft Dynamics Marketing! Microsoft delivers business and feature enhancements that help employees to be more productive in the office and on the go, make better decisions through key business and customer insight, better serve customers with integrated knowledge management, and increase the impact of marketing investments. Improved navigation and user interface options: Increase adoption with an improved user experience, including new UI themes and faster navigation to records. Track email by folder: Folder tracking provides a new and intuitive way to track incoming email activities on any device that supports Exchange. Now you can track your email directly from virtually any device. Track incoming email wherever you are: Use the new CRM App for Outlook to track incoming email with the desktop version of Outlook Web App (included in Office 365). CRM App for Outlook also works with Outlook 2013 and Outlook for Mac. 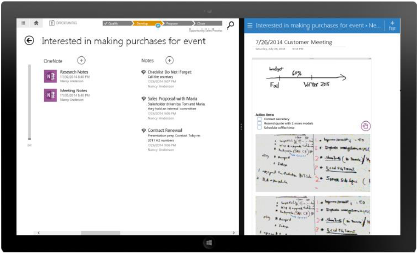 This Preview feature will be available soon after CRM 2015 Online Update 1 is released. Immersive Excel experience: Now you can use Microsoft Excel Online to do quick analysis right from CRM Online. Excel export completely redesigned: With a single click, you can export to Excel anywhere, including the desktop version of Excel (2007 and later), Excel Online, and other Excel clients. New Power Query connector: Use the new connector to easily retrieve data from CRM Online for self-service business intelligence (BI). Create Office 365 Groups: Collaborate with team members who don’t have access to CRM Online with Office 365 Groups. For example, create a group for your sales team, invite other Office 365 users to join the group, and then share documents, email, OneNote notes, and more. 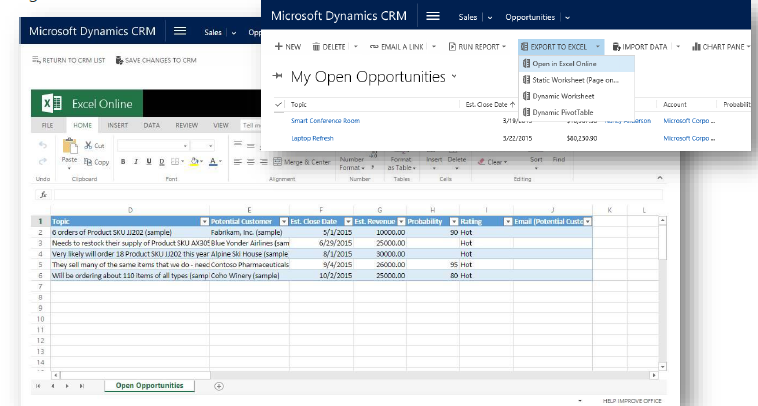 This Preview feature will be available soon after CRM 2015 Online Update 1 is released. Embedded OneNote: Capture photos, take voice notes, do free-form drawings, and more. Everything is automatically linked with the record in CRM Online. Social sales: Define rules for creating or updating CRM records from incoming activities. For example, you can now generate leads or opportunities from social posts. Mobile sales: With the new CRM for Phones app, enjoy the same great mobile experience on your phone as you do on your tablet. Nurture your leads and opportunities through the sales process with the new intuitive interface. Secure your mobile data: Microsoft Dynamics CRM for Good, integrated with Good Dynamics, protects your CRM data even if you lose or leave your tablet somewhere. Integrated Parature knowledge base: Empower agents with knowledge base integrated into daily service interactions, including the ability to both search and receive automated suggestions. Significantly improved form performance: A newly built form rendering engine provides fast form load while maintaining compatibility. Dynamics CRM 2015 Spring Release is also known as Dynamics CRM 2015 – Service Pack1 or as the Carina release. Dynamics CRM 2015 Spring Release will be available by end of 2015 for on premise installations. https://admiraldynamics.com/web/wp-content/uploads/2015/05/Dynamics-2015-Update-1.jpg 1114 1071 Marga Van Laere https://admiraldynamics.com/web/wp-content/uploads/2019/01/Admiral-Dynamics-in-synergy-with-INNITO_logo_380x156px.png Marga Van Laere2015-05-04 10:22:082016-10-06 07:08:38Microsoft amazes customers once again!